The UCSD mathematics department’s recent decision to start capping all new math majors is another chapter in what appears to be a constant trend of underfunding and mismanagement among the UCSD administration. For those who have not already heard, only a limited number of students will be eligible to enter the math department — which includes pure mathematics, applied mathematics and mathematics-computer science, one of the fastest-growing majors. Part of this is understandable — UCSD receives far less funding per student than it has historically received. Yet this is only a partial excuse for failing to explore creative solutions for enrolling more students into math courses. We as students need to hold the mathematics department accountable for failing to ensure that math classes are accessible to all, and we need to push the department toward finding new ways to increase enrollment without reducing the quality of the classes. Some of the reasons why the math department has decided to take such an extreme step are justified by data. For Fall Quarter 2015, UCSD had 1685 math-department majors, significantly more than UCLA (989 math-related majors) or UC Davis (819 in its math-statistics department). Unfortunately, UCSD has the smallest per-undergraduate endowment compared to these two schools (less than half of UCLA’s per-undergraduate endowment) and the largest ratio of students to faculty, according to U.S. News. The CSE department is one of the worst offenders of a high student-faculty ratio, with a ratio of 52.7, shockingly high compared to 28.7 at UCLA and 26.1 at UC Davis, according to the American Society for Engineering Education statistics. To give the CSE department some credit, it does have a number of undergraduate tutors, but tutors do not have extensive study in computer science and, at best, they are a quick-fix band-aid for a serious lack of faculty. In addition, the CSE department also shares some of the blame for the huge increase in math-department majors. The less-competitive math-CS major is commonly adopted by students who are unable to enter a normal CS major since the GPA requirements for entering are incredibly strict. 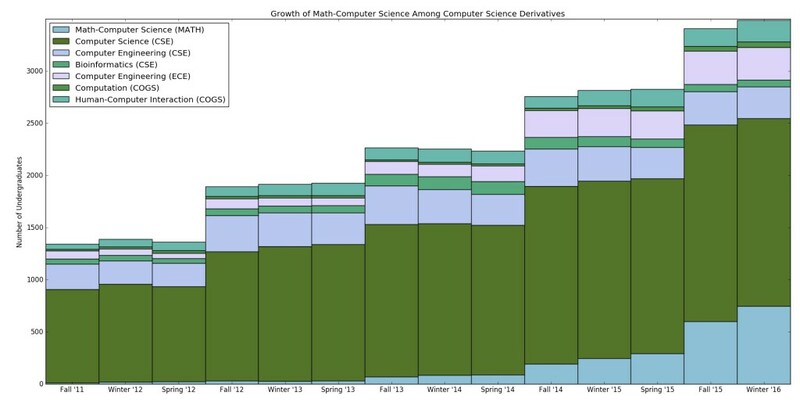 Unfortunately, this has led to a whopping 211 percent increase in the number of math-CS majors from Fall Quarter 2014 to Fall Quarter 2015, according to official enrollment statistics. 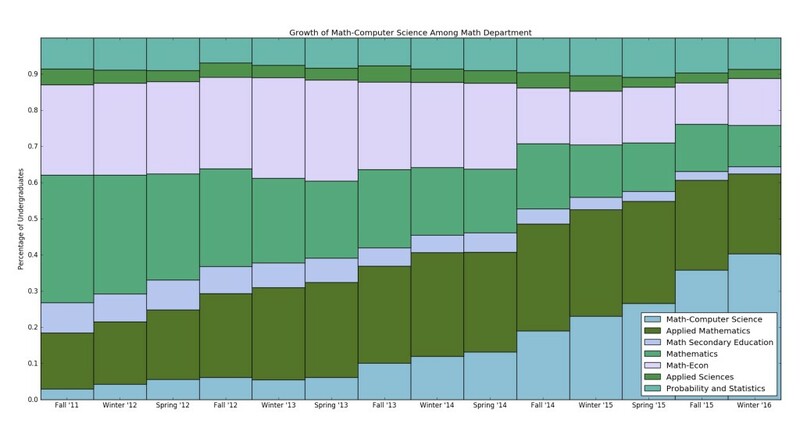 Comparatively, the number of total majors in the math department (excluding math-CS) grew only 31 percent during that same time period, with some majors, such as math-secondary education or math-applied science, remaining mostly constant. The computer-science major, however, only grew at a rate of 10 percent during this same time, since the CSE department strictly controls who enters the major. If the computer-science department had done more to enroll more students in its classes, the math department would likely not face an unfair burden to make up for the computer-science department’s failures. 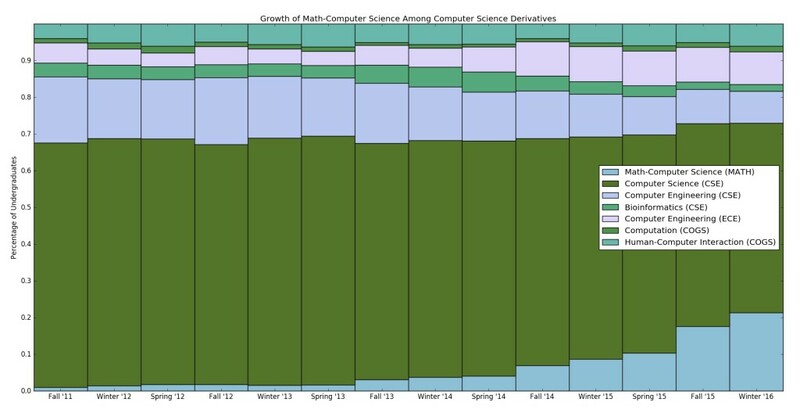 Proportion of Math-CS majors compared to the Math department. 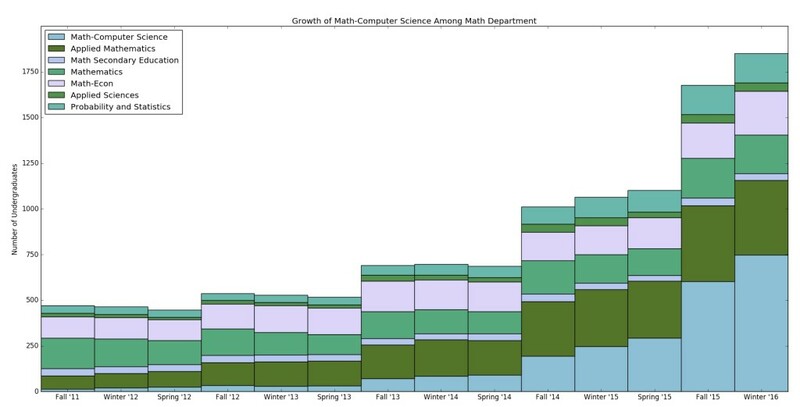 Absolute growth of Math-CS major compared to the Math department. Data Visualization by Miguel Sheker. Both the computer-science and mathematics departments should begin to explore innovative ways to enroll more students. One possible solution is to increase online learning for some of the larger classes, but this often leads to a decrease in quality. Online learning, when done right and combined with numerous office hours and tutoring sessions, can be very effective at teaching students, yet there currently exists no such programs within the UCSD math or computer-science departments. The math and computer-science departments could easily create a system in which students interactively learn the material through online media. Students can then come into section and lecture for additional help or practice. Another option is to make discussion sections more critical to the course. Currently, the vast majority of math and computer-science discussion sections are optional and designed for reviewing lecture material and helping struggling students. While this is indeed important, teaching assistants could teach new material during discussion section and encourage struggling students to visit during office hours. This would reduce the workload on any individual professor and allow them to educate more students without sacrificing quality. Of course, the best solution to solving over-enrollment would be to simply hire more professors, but given UCSD’s diminished budget and lack of attention to undergraduate education, this is unlikely to happen any time soon. However, the math department is unlikely to pursue these potential solutions without any impetus from the undergraduate body. So far, student reaction to the math department’s announcement has largely been resigned irritation, not passionate outrage. Capping a group of majors should be seen as an absolute last-ditch scenario and something to only be tried once other structural changes have been made. In this case, it is not apparent that the math department has even attempted, let alone implemented, any possible solutions for mitigating the large number of interested students. We as students need to step up and protest this decision, otherwise the administration will continue to act against our interests and against the quality of our education. A typical outraged student opinion, devoid of grounding in reality. 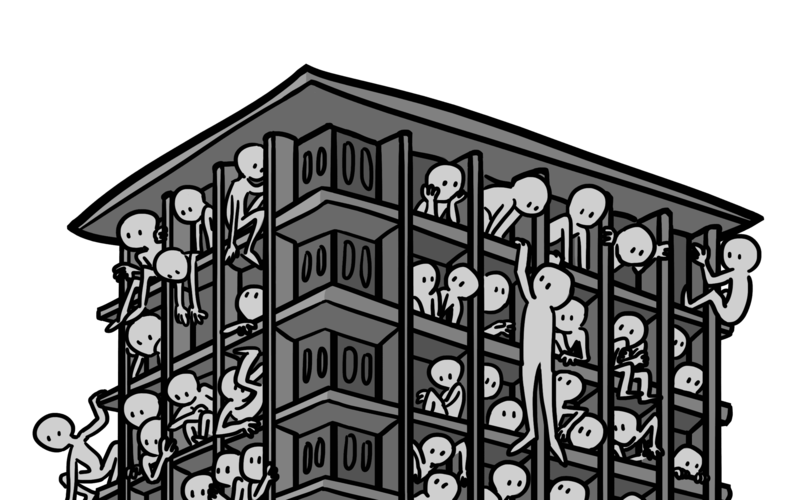 The problem lies not with the Math department, but with unreasonable growth of overall student numbers on a campus ill-equipped to ever deal with such influx. Think about space, before you think about anything else. You need to put everyone somewhere before you can hire more faculty, TAs, etc. New space is not slated for Math, but for student housing. So you will have somewhere to sleep, but no where to take your Math classes. It looks like students are desperate to get into computer science and the regular CSE major is capped.